Sadaam Maake's home would be a fitting shrine to the football gods. It is filled with football memorabilia such as tickets, trophy replicas and jerseys. 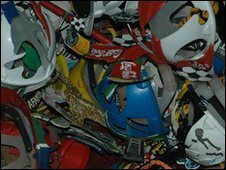 More than 200 "makarapa" plastic helmets and vuvuzelas (long trumpets) - both essential garb for any South African soccer fan - adorn Mr Maake's tiny lounge. 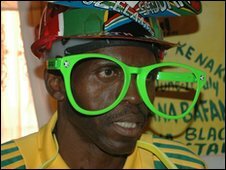 Before our interview, he insists on "kitting up first"- he changes into a tracksuit in the colours of the national team Bafana Bafana and completes the look with oversized glasses. "I am ready to talk about football now," he says, smiling. At 55 years old, he says he has lost count of how many times he has been to a stadium. "I'm a soccer slave. I drink football, I eat football, I talk football. Everything in my life revolves around soccer. It is my passion," says Mr Maake. Mr Maake has been dubbed South Africa's "number one football fan" by local media and Kaizer Chiefs, one of South Africa's oldest and biggest clubs, which he has supported for 40 years. An animated man, he speaks with great passion about the atmosphere in local football stadia. "There are 80,000 people at a stadium at a go, all cheering and excited about the game. Here I make new friends. "For 90 minutes, a brotherhood prevails here, strangers become instant friends," he says. 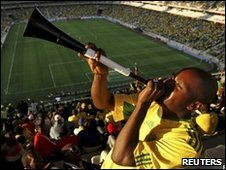 One of the unifiers at South Africa's football matches is the sound of the vuvuzela. Mr Maake is the man who made the vuvuzela famous here. "If you don't hear a vuvuzela playing at a game you are not in South Africa. This is our thing, international fans need to embrace it." The trumpets will be blaring loudly at the World Cup, despite a number of attempts by some international clubs and commentators to have them banned because of the noise. "I've been arrested three times over the years and charged with public disturbance because of this vuvuzela. I've even been bitten by police dogs, but I will continue to play it," he said. But he warns fans to be careful when blowing the instrument near children or people with sensitive hearing. Mr Maake says he cannot wait to see the national team play the world on home soil. "This is a hell of a joint, it is the first - and perhaps the last - time we ever host the World Cup in Africa. We must do ourselves proud," he beams. The avid fan adds that this is Africa's time to shine. "Africa's 'six-pack' - Nigeria, Ivory Coast, Cameroon, Algeria, SA and Ghana - must be in the final." "The cup must stay in Africa." Mr Maake is a local ambassador for the tournament - in the past year he has been touring the country educating people about the ticketing process. He speaks candidly about the World Cup tickets, which still have not sold out. "If the international fans don't buy the tickets, we will. We will fill the stadia ourselves and cheer for their teams if we have to. "The teams will play whether the fans are there or not. The game will go on, why should we be worried about ticket sales?" he asks. Sixty-four matches will be played during the June sporting event. Mr Maake's 13 children all have tickets to a number of them. "If it were up to me, I'd watch all the games. My family and I will go to all the games where South Africa and all the African countries are playing and some international teams like Portugal," he said. 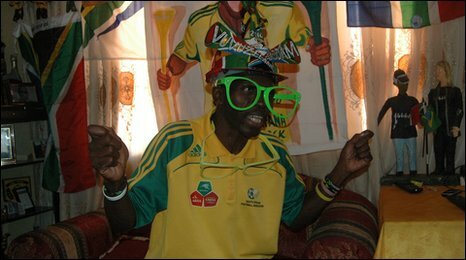 Mr Maake, who lives in in Tembisa, east of Johannesburg, loves football so much he sings about it. He released an album some years ago named after his son Cellular, titled Vuvuzela Cellular. "There is a lot of singing at stadia. I came up with the idea of an album because of that. I love singing about football because it makes fans happy." He worked on it with his children. Though none of the songs are likely to be chart-toppers, he still he has a large following in his home province of Limpopo. Mr Maake's obsessive love for the game has come at a price. He has never wed, saying he has had difficulties finding a woman who understands his passion for football. "No woman can put up with a man who travels every day of the week just for football. Even when I'm at home this is all I talk about," he laughs. "Just look at how the lounge is decorated, what woman would like this," he asks pointing to the pile of helmets under a table in the lounge. The relationship between makarapa and fans dates back to the 1970s when they were originally worn to protect the head from beer bottles thrown at riotous games. Nowadays, they are purely decorative, with fans expressing their individuality by painting the helmets. Mr Maake's passion has also cost him his job - on several occasions. He first worked at a retail store in Johannesburg and was later employed at a car rental company. "I'd be called to disciplinary hearings all the time because I would miss work during the week if my team was playing. I just couldn't miss a game. "It just wasn't working out; I didn't try to find a job since. But my football has been taking care of me," he explains. With a month to go to the World Cup, Mr Maake has started learning a few languages including French - all to welcome international visitors. He has the basics down, but says the greatest welcome they will receive is the hospitality of South Africans and the buzz around the World Cup. "We are ready, we are waiting. This is it," he cheers. How dangerous is South Africa? Will World Cup change SA?